Every Own Your Hill project begins with one goal in mind – growth. We want to ensure that our clients see a return on their investment time and time again, and understand the purpose of every single step of the process. The best way to achieve this is to begin with a strategic mindset and an intense focus on results. Through our Roadmapping process we are able to provide detailed growth strategy consulting in an efficient, simple format. 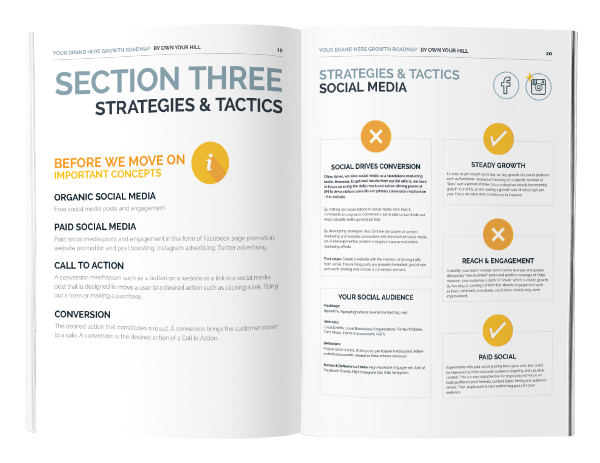 From your overall mission, to exactly who your audience is and the way they make decisions, to messaging, social media, website and content strategy, your Roadmap will cover everything you need to know to take your first steps towards growth. Throughout your project and into the future, we will work with you one on one each month through our Monthly Growth Consulting service to ensure that every step you take is leading you where you want to go. From analytics and stats reporting, to workshops for your staff or volunteers, to detailed pricing and product strategy, our services are designed to give you everything you need to achieve your goals. We believe that a strong brand is more than a pretty design or a trendy font. Your brand should be a visual representation of your story. Whether we’re choosing a color palette or hand-drawing era-inspired type, we are always 100% focused on the story you want to tell your audience. Do you already have a brand in place, but need to create consistency in your image? We can work with you, your committee, board or volunteers to refine and select the best visual elements to tell the story of your business or organization. We believe in a unique approach to web design and development. 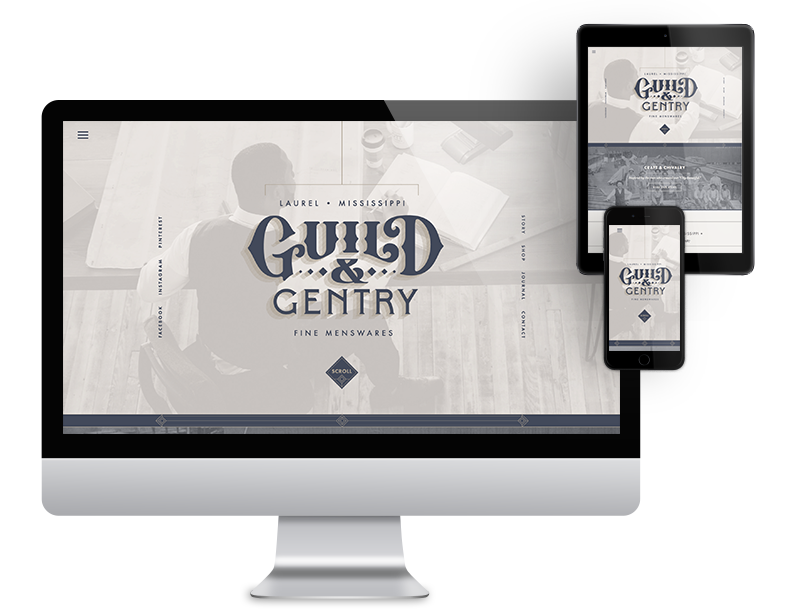 Rather than focusing on building our design portfolio, we are focused on building your business. We use a strong and versatile WordPress theme to avoid the costs of extensive, custom development. We work to mold the base design to represent your brand and story through imagery, graphic design, and great copy. This frees up our time (and your budget) to focus on the elements of your website that will lead to growth, such as conversion optimization, persuasive copy, search engine optimization and e-commerce strategies. Your customers see a website that is 100% you and speaks to their needs and desires, and you see results. Our content creation strategies go far beyond your typical blog post. Through intense research and strategic development, we have created a system of content for small town businesses and organizations that absolutely ensures traffic increases and long-term audience attention and engagement. Our content sparks conversations, brings cherished memories rushing back, and calls out to be shared with friends and family. But written content works best when paired with the very best visuals. Our internationally-published photographer and award-winning video production specialist will work to create incredible imagery that will complete the story of your brand, and leave your audience wanting more. Do you need to draw attention to an important event, or increase sign-ups for your initiative? We can expertly manage your online marketing campaigns to get great results while making the best use of your budget. We offer social advertising management for individual campaigns, or monthly budget-management for long-term initiatives. We can create your imagery and copy, and manage analytics for your campaign. Want to take the headache (and costs) out of creating your email newsletter? We can automate your email marketing campaigns so that you can focus your time on the hands-on projects that will lead you to growth. “Bethany and her team are amazing! The results are remarkable. In less than a year, she made our online marketing a more beautiful, useful tool that helps us get our message out… all while keeping our focus on our target demographic. Graphic Design is more than great illustration or beautiful type. It sparks a conversation. It draws your audience in and whispers your story in their ear. It inspires them to seek out more about you and to see your business or organization in a different light. When you give a great graphic designer an expertly-crafted strategy coupled with a great story, the results are untouchable. And we aren’t afraid to say it – our graphic design specialist is the very best in Mississippi.